Come Follow Me at a Simply Klassic Home!!! I keep seeing comments and new followers to Betty Crocker Wannabe, which is great! I'm thrilled you are still loving this blog. However, I won't be adding new content, so I would love if you would change your link to www.asimplyklassichome.blogspot.com. I'm currently sharing a 31 Days of Simply Homemade recipes series, and in December, I'll be hosting a 12 Days of Christmas Printables party!! So please click on over and A Simply Klassic Home. I promise you won't be disappointed!!! I'm always looking for ways to make our morning routine go smoother, and breakfast seems to be the thing we never have time for. Soooo...drive-thru it is! I LOVE McDonald's Egg McMuffins, but I also know that they aren't the healthiest thing we could be eating for breakfast (or the cheapest). So what to do when you want something quick and easy and inexpensive for breakfast? You make them at home! It's so easy...you cook the egg right in the microwave! I first tried this recipe out on a Sunday morning. Rick called me at work the next day (on my cell) three times until I finally called him back. I asked him what was wrong. He said "How did you make that egg in the microwave?" Yup, that's why he called THREE times in FIVE minutes. I gave him the instructions, and could hear my boss laughing in the background. I told Rick my boss thought it was funny, so ten minutes later I got a text from him saying "I'm texting so your boss can't hear...but that was so cool!" Spray a coffee mug with cooking spray. Crack the egg in a coffee mug and scramble with a fork. Cover with a wet paper towel and microwave for about 40 seconds. 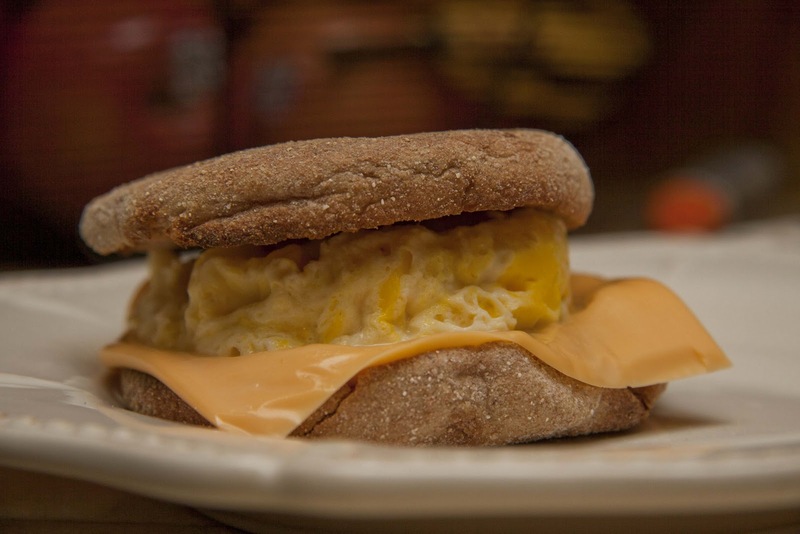 Place the cheese slice on one side of the english muffin, top with the egg, and the other muffin half and enjoy! You could also add Canadian bacon, a sausage patty, or bacon...although those don't exactly make it "healthier." It's amazing how in the blog world, things can so unexpectedly touch your heart. I just completed a blog design makeover, that Kate of Salvage Dior had given away, for Deanna of It's Just Me. The day after she won, Deanna was diagnosed with Stage 1 Cervical Cancer. She has a husband and two girls, and for her eight year old daughter, this will be especially frightening. She is ready to fight, but could really use positive thoughts and prayers. I was blessed this week by meeting her, and I was thrilled to be able to give her something fresh and new, amidst the pain of her diagnosis. If you have a moment, please go by and check out Deanna's blog and make sure to show a little love while you're there. Click on her button to visit Deanna's blog. I tried out a new recipe the other day. It's satisfying for the sweet tooth and good for you and filling too! 2. In a large bowl, combine sugars, yogurt, egg, oil, milk, and vanilla; mix well. In medium bowl, combine flour, baking soda, cinnamon and salt; mix well. Add to yogurt mixture; mix well. Stir in oats and add-ins of your choice (I used cranberries and chocolate chips; 1/2 cup of each). 3. Spread dough onto bottom of ungreased 9x13 baking pan. 4. Bake 28-30 minutes or until light golden brown. Cool completely on wire rack. Or just do what we do and cut into them as soon as they don't burn your fingers when you touch them. I have more recipes to share later this week as time permits...we are beginning a remodel of our enclosed patio on Friday...which happens to be the playroom and laundry room, so we will be living for two weeks without either. Pray for me.